It was a great evening of clips, analysis and activism, guiding us on a journey through some of the systemic problems with the global economy, to the financial crisis and its consequences and finally to some exciting campaigns and alternatives that are taking place. The almost unbelievable stories presented in the Inside Job showed how deregulation and the capture of government by Wall Street allowed the banks to reap havoc with the economy, taking ridiculous risks and even tricking their customers to take risks they knew wouldn’t pay off – which they then bet against! Marxist historian David Harvey provided a succinct explanation for why capitalism will always lead us to such crises, accompanied by beautiful draw-as-you-speak illustrations, while Paul Mason provided an insight into the deep-rooted structural problems that led to our failed economy and how the crisis is affecting people across the UK. On the night we were also lucky to have Sargon Nissan with us, an ex-investment banker turned economic activist. In particular, insight around sovereign debt – the latest manifestation of the crisis – showed how declaring a country bankrupt is a purely political act, and often prevented by international financial institutions and governments who would be adversely affected (e.g. Ireland being made to keep servicing its debt to a defunct bank by Germany and the European Central Bank). The evening ended on a more positive note – looking at alternatives out there and movements that are happening across the world demanding another economy that works for them, and making it happen. Particular thanks to everyone shared their campaigns and alternative projects with the rest of the audience. You can find a list of these with links below – get involved! There is also a list of all of the films and clips that were screened below in case you weren’t able to make it/want to share them around/feel that three hours of economics viewing just wasn’t enough for you! Great to see you all, and catch you again next time. Three years after the collapse of Lehman Brothers, governments are squeezing communities to ensure business as usual for an increasingly feral elite. Fresh questions are being raised: Are we in need of better policies and stricter financial regulation? Or do we need an entirely new economic system? We’re seeing threats of widespread financial collapse and public sector cuts in the UK and across Europe, home repossessions, record levels of unemployment, yet ever-higher wages for corporate executives, declining tax receipts by the rich, booming city profits and deepening inequality. Ordinary people are asking: Is it time to build an alternative, sustainable economy that really serves our interests? Amid the rise of strikes and resistance everywhere and the growing global Occupy Movement, 6 Billion Ways is hosting an evening of informative and inspirational films and analysis, about the economic crisis and what we, the 99% are doing about it! Let us know you’re coming on Facebook. On 28 November, negotiators from across the world gather in Durban for the international climate talks, hoping to tackle the planetary emergency. Already extreme weather events are taking away people’s lives and livelihoods in Pakistan through floods, East Africa through droughts and small Pacific islands through rising ocean acidification depleting fish stocks. The solutions being pushed by powerful governments in the run up to Durban are not fit for purpose. Instead, they’re mirroring the response we’re hearing throughout the global economy: we have to cut public spending and turn to unaccountable private sector players to deliver – or at least where a profit can be made. Corporate lobbying ensures false solutions like carbon markets, off-setting and ‘do what you can’ emissions cuts keep the interests of the 1% happy while the rest of us face a future of catastrophic climate change. As the potential for agreement unravels before us, people are rising up in protest around the world against an agenda that fails the 99%. Movements from across the world are marching through Durban next weekend to demand real climate justice solutions. Occupy movements across the world will be staging solidarity actions and many cities will be holding their own protests in a global day of action. In the UK, Occupy London, 6 Billion Ways and other allies will be holding a series of climate justice teach-outs on the Saturday morning around the Occupy St Paul’s site (check the Tent City University website for updates), facilitating workshops on the key climate justice issues. A placard and banner making space will also be available, in preparation for the Campaign Against Climate Change march which sets off from Blackfriars bridge at 1pm. Equipped with newly-created placards, an Occupy London/6 Billion Ways bloc will take a climate ‘tour of shame’ past some of the world’s worst climate change villains, before joining the march to Parliament for the Climate Justice Rally. Campaign Against Climate Change will also be holding a climate refugee vigil the night before, between 12 midnight and 1am on the Thames foreshore. The first of our film nights hosted at Rich Mix explored the concept of food sovereignty through a series of short films and discussions on the problems of the existing global food system and the need for, and viability of, alternatives. With well over 200 people in attendance, this was a fantastic occasion in bringing together a range of food campaigners and global justice campaigners with an interest in the politics of food. Food sovereignty is a concept developed by La Via Campesina as an alternative to neoliberal policies. It focuses on local agricultural production, access of peasants to land, water, seeds, and credit, and popular participation in determining agricultural policy. More information can be found in this video by La Via Campesina on food sovereignty. The global campaign for food sovereignty, which is growing in momentum, is therefore a crucial aspect of the fight for social, economic, and environmental justice. Discussion was animated and thought-provoking and we were fortunate enough to be joined by Kirtana Chandrasekaran, a food campaigner for Friends of the Earth International, and Dan Iles, a local food campaigner in Bristol and a UK delegate to the recent Nyeleni European Food Sovereignty Forum in August. A range of issues were addressed, including the significance of local grassroots action, the relative merits of food sovereignty and fair trade, and the potential of ‘traditional’ agricultural methods. 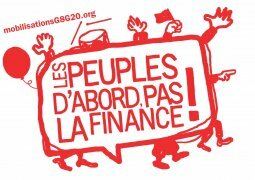 The G20 summit will take place this year on 3 and 4 November in Cannes and preparations are underway for the ‘People First, Not Finance’ Alter-Forum to be held in Nice from 1 to 4 November. The G20 has a powerful influence on global economic policy and, in the midst of sustained financial crisis and deepening economic austerity, remains a major target for the global justice movement. They are 20, we are billions: global governance. Details are still in the planning stages and more information will be available soon. Keep checking the 6 Billion Ways website for more updates and details on how to get involved. For more information, see the website of the French G8G20 2011 Coalition. 6 Billion Ways presents an evening of short films, speakers, music and info stalls. While a billion people go hungry, hundreds of thousands suffer obesity and food producers in rich and poor countries alike struggle to make a living. The global food system is dysfunctional – but there are solutions. 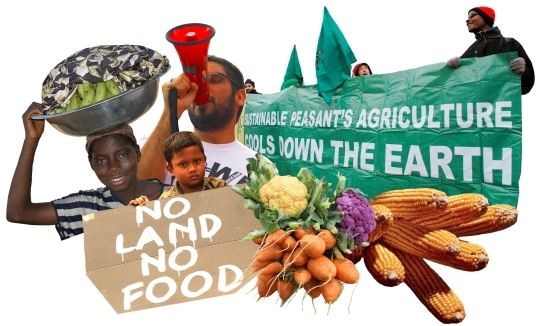 Our evening will explore the idea of food sovereignty, a way of putting both people and the planet first, and challenging the corporate dominance that makes our food system so unsustainable. We’ll have a series of short films, interspersed with expert speakers and discussion. Then Asian Dub Foundation’s John Pandit will kick up some tunes while you dance, chat or find out more about food justice campaigning. The Real News report from Honduras – A report from Honduras documenting the evictions faced by small farmers and the growing movement of farmers seeking constitutional reform to guarantee a more equal land distribution. Not a very green revolution – A short film highlighting the problems with India’s ‘Green Revolution’ where unsustainable agriculture has caused environmental problems and driven farmers into debt. I eat therefore I am – Critically analyses the workings of the modern global food system and powerfully advocates the necessity of food sovereignty as a solution. Detroit: Rising from the Ashes – The story of Detroit residents attempting to rebuild and revive their derelict communities through growing their own food in 1,300 urban gardens. Natabar the seed farmer – The story of farmers like Natabar, who reject dependence on industrial hybrid seeds in favour of saving indigenous rice seeds. Upendra has worms – A very short film which documents a growing shift back from the use of chemicals to traditional agricultural methods, such as the use of worm-culture in sustainable organic farming. Kirtana Chandrasekaran A food campaigner for Friends of the Earth International, who will talk about the growing global movement for food sovereignty in the context of corporate dominance of the food chain. Dan Iles Local food campaigner in Bristol, involved in setting up a grocery co-op, and a UK delegate to the European Food Sovereignty Forum in Austria this August, which he will be reporting back from. We’re currently looking for a volunteer to support ongoing work led by individuals in each of the partner organisations and help to facilitate joint activities. The post holder will look after the 6 Billion Ways website, email list and social media, help with administration and logistics and project managing events. If you’re a natural organiser looking for experience in a campaigning organisation, we’d like to hear from you. Whilst this volunteer post will be part of a coalition of organisations , the post-holder will work from the offices of the World Development Movement in Kennington, south London. However, there will be the opportunity to work from the offices of the 6 Billion Ways partners from time to time; thus offering an insight into a variety of campaigning organisations. The post-holder can follow flexible working hours; we would expect one day per week to be spent in the office, the other day could be spent in the office or could be taken during evenings and weekends as would best suit the individual and the role (there will be several events and meetings taking place outside regular working hours). 6 Billion Ways is a coalition of organisations (Friends of the Earth, War on Want, Jubilee Debt Campaign and the World Development Movement). In partnership with Rich Mix, we have organised large-scale activist conferences in East London in 2009 and 2011. We are continuing to work together, sharing an understanding of how our organisations can better contribute to building a global justice movement if we work together. To apply, please send a cover letter and CV to James O’Nions at james@wdm.org.uk. Shortlisted candidates will be invited for an informal chat at the WDM office, shortly after the deadline.